We cultivate success through a diverse culture of experiential learning, discovery, and innovation. Cal Poly Pomona will be the model for an inclusive polytechnic university that inspires creativity and innovation, embraces local and global challenges, and transforms lives. Cal Poly Pomona launched a new strategic planning initiative in winter quarter 2016. The Strategic Planning website has been launched, giving the campus community an opportunity to share vital input as Cal Poly Pomona charts a course for the next several years. Discover the university's core principles in this campaign video. Academic Excellence – We demonstrate academic quality, relevance, and excellence through our teaching, learning, scholarship, and creative activities with student centered faculty in an evidence-based culture. Experiential Learning – Our polytechnic identity fosters an integrative approach to education through collaboration, discovery, learn-by-doing, and innovation. Our approach encourages reflection, informed risk-taking, and continuous learning. Student Learning and Success – We are deeply committed to educational experiences and supportive services that engage our students, enhance personal well-being and growth, provide career opportunities, and foster ethical citizenship. Inclusivity – Our diversity across multiple dimensions reflects and enhances our community. We are welcoming and respectful, and we value diversity. Community Engagement – We nurture mutually beneficial and meaningful relationships with community partners and stakeholders. Social and Environmental Responsibility – As global citizens, our individual and collective actions reflect our commitment to one another, society, and the environment. As an expression of our polytechnic identity, all students at Cal Poly Pomona will engage in experiential applied learning across all disciplines. 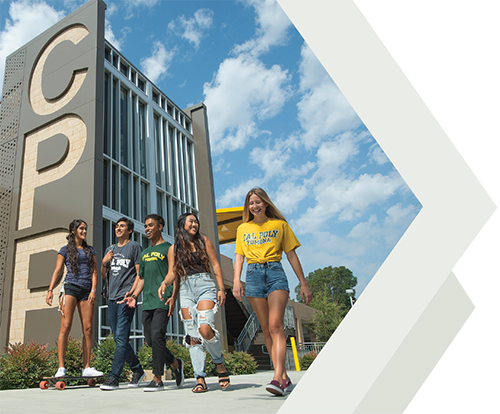 Expand opportunities for students to experience the distinguishing hallmarks of a Cal Poly Pomona education: integrative learning, discovery, and creativity. Establish centers of excellence that will capitalize on our polytechnic identity, strengths and synergistic opportunities for discovery, innovation, and creative expression. Revitalize the General Education program by reimagining the integration of the liberal arts and sciences within the context of our polytechnic identity. Re-envision the co-curricular experience of students as they move in, through and beyond the University community. Design effective strategies that optimize the retention, persistence and achievement of students from historically underserved communities. Develop innovative strategies to increase the graduation rates of all students. Expand the digital student experience to provide timely and effective services that support students and their success. Encourage widespread student engagement in experiences that foster strong and enduring relationships and a sense of belonging in a vibrant campus community. Create a culture that promotes wellbeing and resiliency. Implement a plan for student success that spans preadmission to one-year post-graduation. Develop a career readiness model that provides students with early and on-going opportunities to engage with alumni, the community, and industry leaders. Create a civic engagement i-Lab to address and solve community concerns and regional needs. Boldly elevate our reputation and showcase our unique polytechnic identity. Generate diverse revenue streams that enable the university to increase tenure density, expand and enhance its programs, and invest in research and development opportunities. Improve the economic and social well-being of our communities by connecting our talent, knowledge and educational resources with local, national and global partners. Implement long-range, systemic approaches to maximize our physical resources (i.e., space, land, water). Become an employer of choice, recognized as a great place to work. Recognize and reward the achievements of individuals, teams, and the impact of teamwork. To advance our vision and strategic initiatives, increase recruitment and retention of diverse faculty, staff and other professionals. Invest in our personnel by expanding professional development opportunities. Improve campus infrastructure, redesign business processes to enhance organizational effectiveness, and be a model for environmental responsibility.